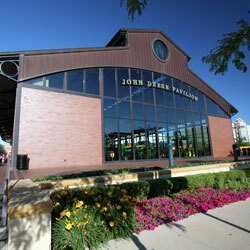 In what year did John Deere move his plow factory to Moline? | River Action, Inc. This is the place where Moline got its start. In 1841, John Spencer and David B. Sears built a stone, timber and brush dam here to provide water power for mills and factories. It was the first physical structure to connect the mainland to the island of Rock Island. In addition to being a dam, it served as a bridge because it was topped with a macadamized surface that accommodated pedestrians, horses, and wagons. In that year, only 13 buildings could be found in Moline, but thereafter the town grew rapidly and by 1848 was home to about 1,000 residents. Clustered around the dam site, on the Moline side as well as on the island, were small mills and factories, including a saw mill, flour mill, machine shop and foundry. Joining them in 1848 was a plow factory operated by John Deere, who had moved his operation from Grand Detour, Illinois to take advantage of the water power here. The original dam was replaced in 1872 by a long, linear dam, sometimes called the Great Wall of Moline. It extended from this spot west to Sylvan Island and stimulated further industrial development. All along the great wall, factories were able to tap into water power. Among others, numerous farm implement plants were established here. Two of the largest were the Moline Plow Company, which in 1929 became Minneapolis-Moline Power Implement Company, and the other, of course, John Deere. In 1873, after the so-called "Great Wall" had been created, an iron truss bridge was erected near here to connect Moline to the island. Today, a stone pier from that bridge is visible on the island, just west of the current bridge. The great wall was replaced in the early 20th century by a hydro-electric dam at the eastern end of Sylvan Island, which is still in use today. Major industrial declines, especially during the 1980's, had a dramatic impact on the farm implement industry and on Moline. Several factories closed and employment was dramatically reduced. Today, at this spot where Moline began, virtually nothing remains of the industrial landscape that had dominated Moline’s waterfront for a century and a half. It was all replaced in the 1990's by the riverfront developments you see here.